Bill Robinson was born on January 28, 1929, in Rivermines, Missouri. He enlisted in the U.S. Army on September 5, 1946, and served with the 82nd Airborne Division before receiving an honorable discharge on August 19, 1949. SSG Robinson joined the Army Reserve on June 12, 1950, and received a commission as a 2d Lt of Infantry in the Army Reserve on July 10, 1951. He transferred to the Texas Army National Guard on May 19, 1960, and went on active duty in the Army on September 25, 1961. 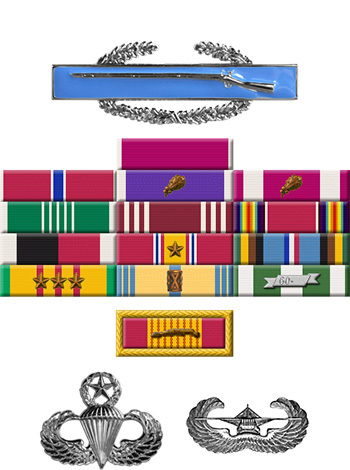 His next assignment was as Commanding Officer of Headquarters Company, Combat Command B of the 49th Armored Division at Dallas, Texas, and then Fort Polk, Louisiana, from September 1961 to September 1962, followed by service as Commanding Officer of Company I, 2nd Training Regiment at U.S. Army Training Center Fort Polk from September 1962 to March 1963. Capt Robinson served as Plans Officer with Headquarters U.S. Army Training Center Fort Polk from April to August 1963, and then attended the U.S. Army Special Warfare School at Fort Bragg, North Carolina, from September to October 1963. He next served as an advisor with the Military Assistance Command in South Vietnam from December 1963 to November 1964, followed by service as Commanding Officer of Detachment A-20 and then B-65 with Company B, 6th Special Forces Group at Fort Bragg from December 1964 to August 1965. 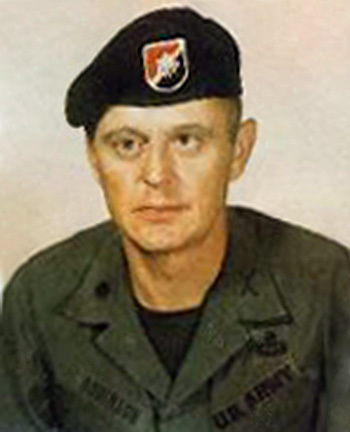 Maj Robinson served as Chief of the Service Support Maintenance Division with the U.S. Army John F. Kennedy Special Warfare School at Fort Bragg from September 1965 to February 1966, and then as a Company Commander and then Executive Officer with 1st Battalion, 32nd Armored Regiment of the 3rd Armored Division in West Germany from March to July 1966. His next assignment was as Training Officer with the Berlin Brigade in Berlin, East Germany, from July 1966 to March 1968, followed by service as an advisor with U.S. Military Assistance Command Vietnam in May 1968, but he was wounded shortly after arriving and returned to the United States in June 1968. After recovering from his injuries, Maj Robinson served as Operations Officer with the 3rd Special Forces Group at Fort Bragg from February to November 1969, and then as Commanding Officer of Company D, 6th Special Forces Group at Fort Bragg from November 1969 to July 1971. During this time, LtCol Robinson served as a planner for Operation Ivory Coast, a clandestine mission to rescue American Prisoners of War at Son Tay, North Vietnam, on November 21, 1970. He deployed to Okinawa and Thailand for the raid, and flew aboard one of the Air Force aircraft over the Gulf of Tonkin during the raid. After attending Command and General Staff College at Fort Leavenworth, Kansas, LtCol Robinson served as a Department Director with the U.S. Army Armor School at Fort Knox, Kentucky, from June 1972 to July 1974, followed by service as Chief of the Aircraft Branch with the U.S. Army Communications Electronics Board at Fort Bragg from August 1974 to March 1976. His final assignment was as Deputy Operations Officer with the U.S. Army John F. Kennedy Center for Military Assistance at Fort Bragg from March 1976 until his retirement from the Army on November 1, 1977. Bill Robinson died on December 29, 2003, and was buried at the Fort Sam Houston National Cemetery in San Antonio, Texas.